If you are planning your next Fishing Trip to Canada. Make sure you visit Wayne and Karla Clark at the Clark’s Resorts & Outposts. We have a total of three Drive-In Resorts and 17 Fly-In Outposts for you to choose from. Clark’s Resorts’ Drive-In Resorts are Northern Lights Resort on Cedar Lake and K.C.’s Landing Resort plus Clark’s Camp on the famous Indian Lake Chain. These lakes all sit in the Vermilion Bay area in Ontario, Canada. Take our privately owned plane, fly between 40 and 150 miles northeast of our Drive-In Resorts, you will be at the remote Clark’s Resort Fly-In Outposts. These outposts are accessible only by our Clark’s Camp float planes. You will find excellent Walleye fishing, Muskie fishing, Northern Pike fishing, Lake Trout Fishing and Small Mouth Bass Fishing. Especially the peak season for Muskie Fishing between middle of July until the middle of September. 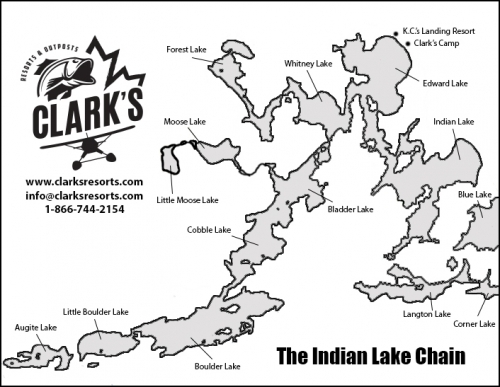 Clark’s Camp & K.C.’s Landing Resort are located on the Edward Lake within the famous Indian Lake Chain. It is very easy to explore all the lakes in the Indian Lake Chain by using our maps and they are all accessible by boat. Clark’s Resort & K.C.’s Landing’s flight services are provided by Wilderness Air in Vermilion Bay Ontario, Canada, which has been in the Norhtwest Ontario local flight business since early 1980s. The Northwest Ontario’s outposts’ Charter services are provided only in a few of the very skillful pilots. 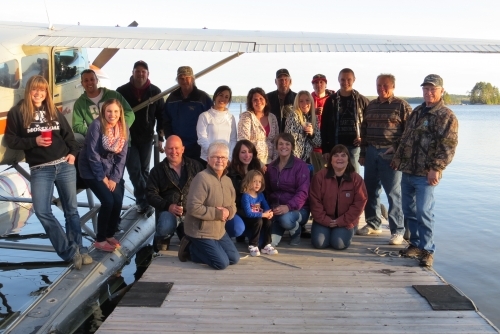 These professionals love their float planes and are very family with the lakes in the area. Cooking tools, stove, oven coffee maker, microwave oven are included in your house-keeping modern cabin package. You do not need to bring any bedding with you when you arrive at Clark’s Resort. We also provide you with a 17’ Lund Outfitter with your choice of 40HP or 50HP motor. For your unforgettable fishing trip you will be given basic fishing equipment such as live bait, depth finder, trolling motor on your boat. Also you are welcome to bring your Own Boat to Clark’s Resort. You can check out our website for up-to-date rates and information about what to bring to your fishing or hunting trip. Just be aware that all rates on our website is in US funds and taxes will be charged on top of that. The pilot will take from the base, drop you off at Clark’s Resort and will pick you up when your stay is over. You will be staying at Clark’s Resort cabin for 5-7 nights with provided 14 or 16 foot long Lund boats. Additional equipment including 8 or 9.5 HP motor, nets, several buckets for your live minnow storage. You will also be given ice, water and towels. All of our cabins come with Hot and cold running water, fridge, stoves and ovens, gas BBQ’s and generators. Eating and cooking tools and bedding supplies are also included. All of our modern cabins are from 2 to 4 bedrooms. Modern cabins have hot & cold running water, a three piece bath, complete kitchen, linens and blankets, a BBQ gas grill on the deck and most importantly a beautiful view of the lake! At any of the Clark’s Resorts, our guests have access to an air-conditioned recreation room with satellite TV, Wi-Fi, books and games. All camps have nice, clean, screened-in fish cleaning houses with complimentary freezer bags and freezer space. We have a very large hunting area where you can enjoy the excitement of a big game hunt for Moose, Black Bear, or Whitetail Deer. Rifle, muzzleloader, and bow hunters are all welcome, but make sure if you are bringing you own firearm from the States, check and read the border crossing regulations. Baited stands are available. We also offer small gam hunts for Grouse and Duck. Please ask us for more information regarding our hunting packages and rates. Leaving from Vermilion Bay, after a short drive you will be at our Clark’s Camp by the Edward Lake. Edward Lake is one of the 10 linked lakes that forms the famous Indian Lake Chain. Clark’s Camp features a total of ten fully equipped cozy cabins. The cabins all overlook the Edward Lake and will accommodate different size of groups (we have 2, 3, 4 bedroom to choose from). Our guests also have access satellite TV, Wi-Fi, a waterfront deck with awesome view of the lake and a beach for outdoor fun. We provide you with live minnows and ice at no charge. You can spend your time at our air-conditioned recreation room or cleaning your trophy at the fish-cleaning house. Also with a short drive or boat ride, you will also have access to our K.C.’s Landing Resort equipment and facilities. All of the Clark’s camp cabins, disregard their sizes, have running water (hot & code), complete bath and shower, full kitchen for your cooking needs, clean towels and blankets, and bbq grill on the patio. For group size of 8 and plus, Clark’s Camp features 2 duplex cabins. These duplex cabins are basically the combination of two 2-bedroom cabins, each features a full kitchen, bathrooms. You will also fine picnic tables, chairs, fire pit on the beach. You will find the best fishing experience at the Indian Lake Chain, at any of the 10 connected lakes. You can travel to or between any of these lake from Edward Lake by boat. Here you will find great fishing for Walleye, Muskie, Northern, Lake Trout, and Small Mouth Bass. There is no need to hire Guides as they are extremely easy to navigate around. Not far from Clark’s Camp (about 1 mile away) is the K.C.’s Landing Resort, which also sits on Edward Lake, on the famous Indian Lake Chain. K.C.’s Landing Resort is a outstanding vacation destination that has 14 year of history. Aside from our awesome Walleye, Muskie, Northern, Lake Trout, and Small Mouth Bass fishing, at K.C.’s Landing Resort, we also provide you the opportunity to experience great winter ice fishing adventure. 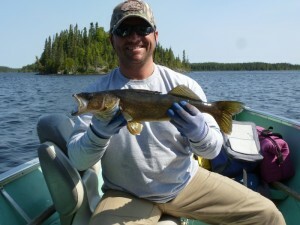 Our guests are able to fish the Indian Lake Chain, Cedar Lake, Cliff Lake, and different encompassing lakes. Winter in Northwestern Ontario is really quite lovely. The air is crisp and clean, and therefore the surroundings are peaceful and pristine! There are miles and miles of powdery snow to carve out on your snowmobile, acres of lake to explore, and spectacular scenery to view even at night. you’ll be able to travel snowmobile for a few Lake Trout, or fish right ahead of camp for Walleye. you’ve got access to our heated ice shacks with holes trained right within – no ought to bundle up! you’ll keep in one amongst our toasty heat, fashionable & deluxe cabins and have access to the room for pool, darts, TV, and Wi-Fi. We have seven cabins to settle on from, some are “standard”, and some are “deluxe” and 2 “ultra-deluxe” cabins. The grounds at K.C.’s Landing Resort are extraordinary. It is close to the water; there’s 1000 square feet of sand beach. There is an oversized summerhouse for cookouts and gatherings, and last a large waterpark for the youngsters. Guests at the K.C’s Landing will even have access to recreation room with television system, Wi-Fi, pool table, air hockey table, and darts. The fish-cleaning room is renewed and is usually immaculate with complimentary refrigerator, luggage storage and freezer room. We have a total of 7 lake side cabins for our guests at K.C.’s Landing Resort. We also have 5 standard fashionable cabins, and a couple of deluxe fashionable cabins, they are newer cabins that includes air-con, television system, and dishwashers. Guests may also value more highly to keep in one among 2 ultra-deluxe cabins, the large House or Birch Cove. All cabins feature an oversized deck with a picnic table or chairs and a read of the lake. All have hot and cold running water, 3-peice bathrooms with shower, complete kitchens spaces, linens and blankets, and gas BBQ’s. The Big house is a huge 2 story house set right by the beach with an outsized deck over-looking the lake. Includes television system, dishwasher, and air conditioning. The house features a giant living space, a bar, an enormous table, and a replacement deluxe room. It has 3 piece bath room and four bedrooms. The Big House is able to accommodate a minimum of six adults. The name, “Birch Cove”, comes from where it is set on. The cabin is facing towards a separate drive-way, a brief distance from K.C.’s Landing Resort. it’s a very personal location with a gorgeous yard that includes birch trees and a pleasant field. The cabin is facing the beautiful lake with a non-public dock. This three room cabins has satellite TV, air conditioning, and a dishwasher. This cabin conjointly has laundry facilities. The Northern Lights Resort is part of Clark’s Resort yet in another remote location. Find out more about Northern Lights Resort here. 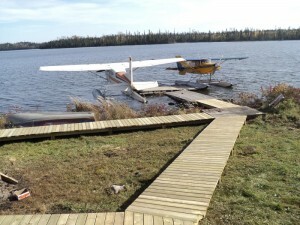 Some guests want to be isolated from others on their Fly-In adventures, yes, you can have the entire lake to yourself! On Grace Lake Clark’s Resort have the only cabin on the lake. Grace Lake is located 84 air miles Northeast of Clark’s Resort’s base. The lake is in the shape of a horseshoe, offering about 8 miles of shoreline to fish. Deep water and lots of underwater structure provide excellent fish spawning and growing environment for Walleye, Northern Pike and Perch too. This Clark’s Resort’s cabin has three separate bedrooms, a large kitchen/living area and large deck overlooking the Grace Lake. The cabin also features a wood stove, new deck railing, new outhouse, new walkways, and the grounds have been transformed by brush cutting and clearing! Clark’s Resort’s cabin on Kapikik Lake is the only cabin on a very large system of lakes. This cabin is Clark’s Resort’s newest and most luxurious log cabin. We will provide you with a generator, electric appliances, a beautiful hand-made rounded bar, a large patio overlooking the Kapikik Lake, a wood stove, a very spacious and well-lit living and kitchen area with beautiful dark wood floors, finished with cathedral ceilings and tongue & groove pine. The Kapikik Lake is one of Clark’s Resort’s largest lakes. It is about 14 miles long and 7 miles wide. It is located 121 air miles Northeast of our base by float plane. 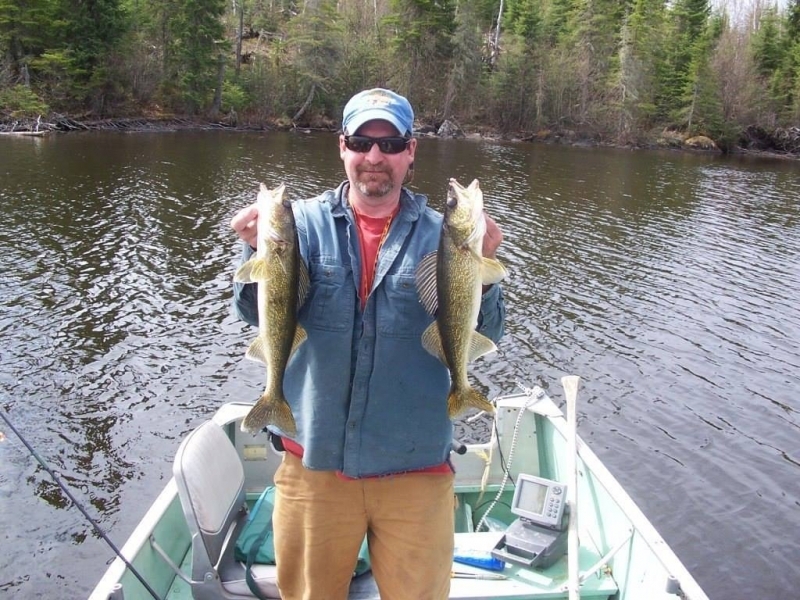 Here you will find supreme Walleye fishing, numerous trophy Northern, and Perch as well. The water in the lake is alive and it’s moving so that it will provide excellent fishing experience, it also has unique structures in the water. 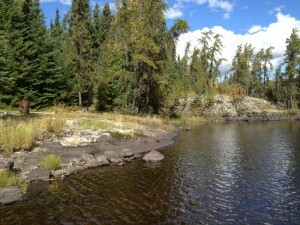 It is the ultimate habitat and spawning ground for Walleye and Northern. You will also find a double outhouse at Kapikik Lake, brand-new wooden walkways, a beautiful floating dock for motored boats, and a brand-new screened-in fish cleaning house. Clark’s Resort’s boats here are brand-new to provide great fishing experience. Kamungishkamo Lake Outpost is another one of Clark’s Resort’s outposts that offer one lake – one group of guests. Our guests at Clark’s Resort call it “KAM” for shorthand. Kamungishkamo is about 145 air miles North of our Clark’s Resort’s main lodge. It is the only cabin on the 10-mile long lake. You are sure to find lots of Walleye, Northern, and Perch in this lake and excellent fishing even if you just fish at our newly finished dock! The cabin is spacious and new and has three bedrooms, a large kitchen/living area with new appliances, a bar, a wood stove, a brand new dock, a sauna, screened-in fish cleaning house, and a large deck! 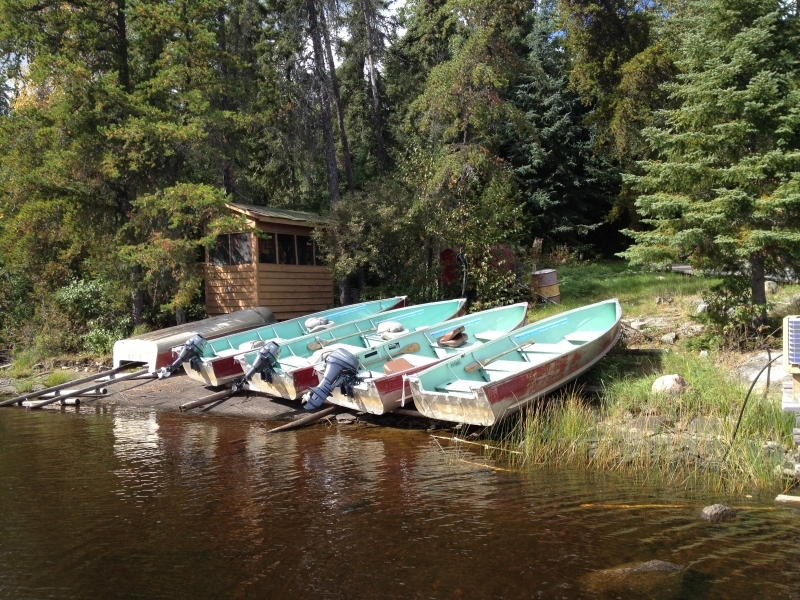 Our guests at McVicar Lake will sure enjoy their stay and the adventure they seek. It is located 124 air miles Northeast of Clark’s Resort’s base, and the lake is about 8 miles long and 5 miles wide. The McVicar Lake has a unique shape with lots of bays, islands, and depths up to 160 feet. There are two rivers flow in and one out of the lake, so there is lots of moving water to fish for walleye and Northern Pike. There is access to Lang Lake (12 miles long and 70′ deep). 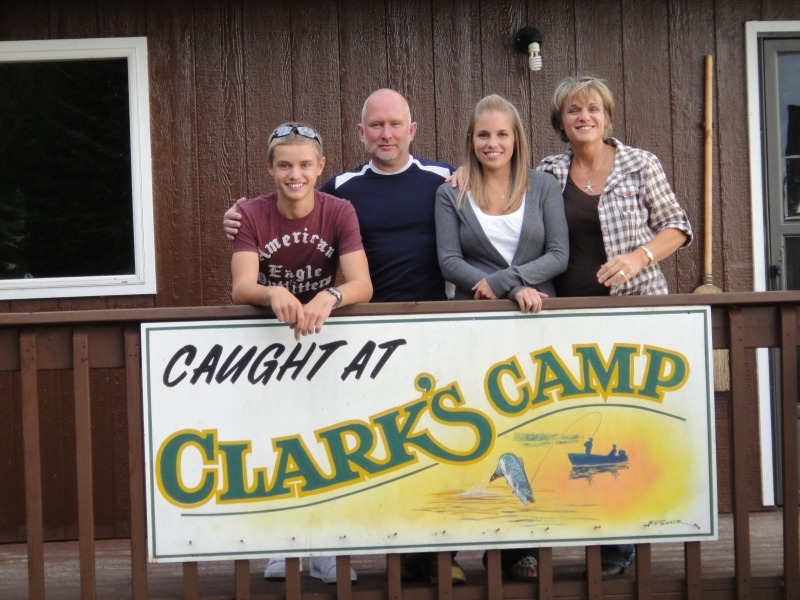 Our guests at the Clark’s Resort come to fish for Walleye and Northern Pike. The cabin is the ONLY one on the McVicar Lake! It has three bedrooms, and is located in a beautiful exclusive bay with the feel of true luxury in the nature. The cabin also features a wood stove, a brand-new deck overlooking the lake, new wooden walkways, and the grounds have been recently cleaned up of brush. Our Shabumeni Lake is about 88 air miles Northeast of Clark’s Resort’s main lodge. Shabumeni Lake is a narrow shaped lake about 13 miles long. Shabumeni Lake is named for its large Walleye population as well as numerous Northern Pike. You will find plenty of moving water to fish on Shabumeni Lake. The cabin features a screened-in porch and is located in a sheltered bay with a sand beach. It is a smaller two bedroom cabin with a wood stove, brand-new walkways and fish-cleaning house, and a new dock. Again, this is the only outpost on the lake! Here is what it’s like to fish walleye and trophy Northern Pike and perch. Betrand Lake is 120 air miles Northeast of Clark’s Resort’s main lodge. 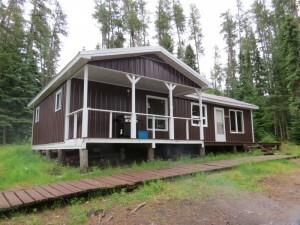 It is s two bedroom cabin, situated on a large island in the middle of the 8-mile long lake. The cabin features a complete kitchen, a bar, a wood stove, a sauna, a nice big deck, brand-new dock, and a screened-in fish cleaning house! Bertrand Lake is best noted for its abundance of trophy Northern Pike and LOTS of Walleyes. Pusher Lake is located 50 air miles Northeast of Clark’s Resort‘s base and is 2 miles wide and 3 miles long. It is connected to Upper Wapesi Lake by a creek, giving guests in this outpost two lakes to fish. Pusher and Upper Wapesi offer fast paced Walleye fishing plus Northern Pike catches to add to your fishing adventure! The cabin, situated on a rock point, offers two separate bedrooms and is the ONLY cabin on the lake! Upper Wapesi is located 53 air miles Northeast of Clark’s Resort’s base and is 1.5 miles wide by 4 miles long and is connected to Pusher Lake by a creek approximately 2 miles in length giving the opportunity to fish two lakes. 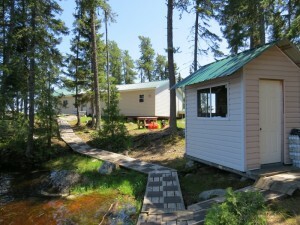 The large cabin offers 3 bedrooms and a large kitchen/living area. The cabin sits on a hill surrounded by pine trees, overlooking the lake and sand beach. Upper Wapesi Lake is just loaded with Walleye & Northern. Have your family vacation and looking to have an entire lake to yourself? Antenna Lake is 46 air miles Northeast of Clark’s Resort’s base. It is 1 and half miles wide by 4 miles long. The dark water and rocky structure makes this lake ideal for excellent Walleye fishing in all season. 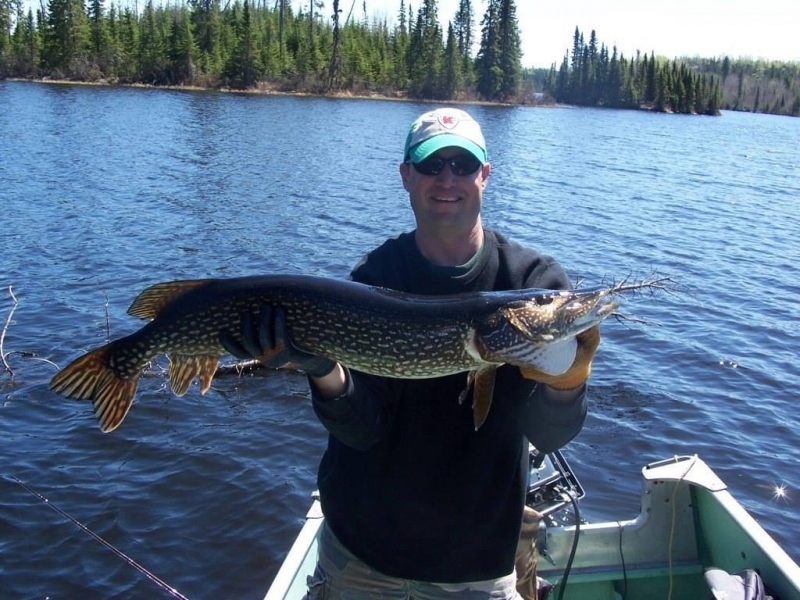 Antenna is also noted for its population of Northern Pike with numerous trophies caught and released each year. Antenna Lake outpost cabin has two bedrooms, and is the only cabin on the lake. Antenna outpost has just had an update to receive a new dock and a beautiful yard. Have the entire lake to yourself at Austin Lake Outpost! Austin Lake is 88 air miles from the Clark’s Resort‘s base in Ear Falls. The cabin is a comfortable 3 bedroom cabin with all the comforts of home. Austin is a smaller lake with dark water and access to a portage lake. It has plenty of long winding channels and bays to explore, there is no shortage of hot spots on this lake to fish. The fishing here consistently produces excellent sizes of Northerns and all the Walleye you could want. Come explore these waters yourself and enjoy the solitude and tremendous fishing at Clark’s Resort’s Austin Lake Outpost. Please come here to experience the beauty of being the only cabin on this lake. Dobie Lake is located 108 air miles from the Clark’s Resort’s air base in Ear Falls. Dobie outpost is basically a larger cabin with three bedrooms. The lake water is deep and dark, it has two flowages feeding into the lake producing the quality and quantity of Walleyes and Northern every fisherman dreams of. The potential for trophy Northern is excellent with all the weed beds. There is always something interesting if you are not fishing. Our guest can hear the calls of the loons or the cry of a timber wolf. The beauty and scenery is definitely get our guest back from time to time. 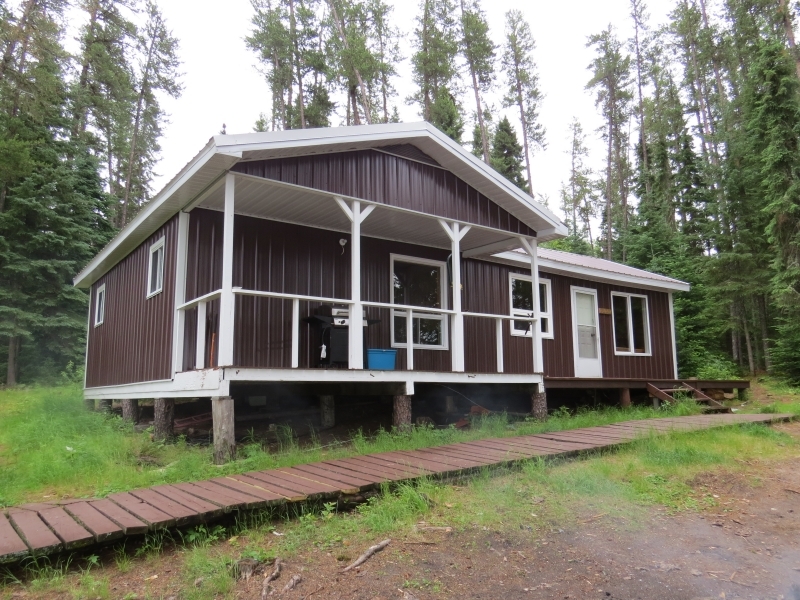 Another comfy and luxurious three bedroom cabin on the famous Fawcett Lake! Fawcett Lake is located 78 air miles from Clark’s Resort’s base in Ear Falls. Fishing on the lake is fantastic, if you can’t catch them here, you won’t be able to catch them anywhere else. This deep dark water of the lake is located on the world famous Cat River system where the Walleye and Northern are king. This lake produces catches in the hundreds. With access into Gull and Zion, you have more water than a man can fish in a lifetime. No wonder anyone who fishes here once returns again and again to relive the experience and see what’s beyond the next bend. Meen Lake has the only cabin on the lake! The stained water in this lake is the headwaters of the Meen River system and is only 95 air miles from the Clark’s Resort’s base in Ear Falls. Meen Lake is a medium sized lake with countless weed beds to cast or troll for trophy Northern Pike and scrappy Walleyes to keep your adventure interesting. You are able to drive your boat down the river to check out the fishing and for a chance to sight a moose or caribou. This is the perfect lake for the Spoon and Rapala fisherman. Are you and your tackle Meen enough to take on the Meen Lake Challenge? Guests of Clark’s Resort love to stay in this large three bedroom cabin overlooking a beautiful, scenic point on Otatakan Lake. Otatakan Lake is 60 air miles from the Clark’s Resort’s air base in Ear Falls. 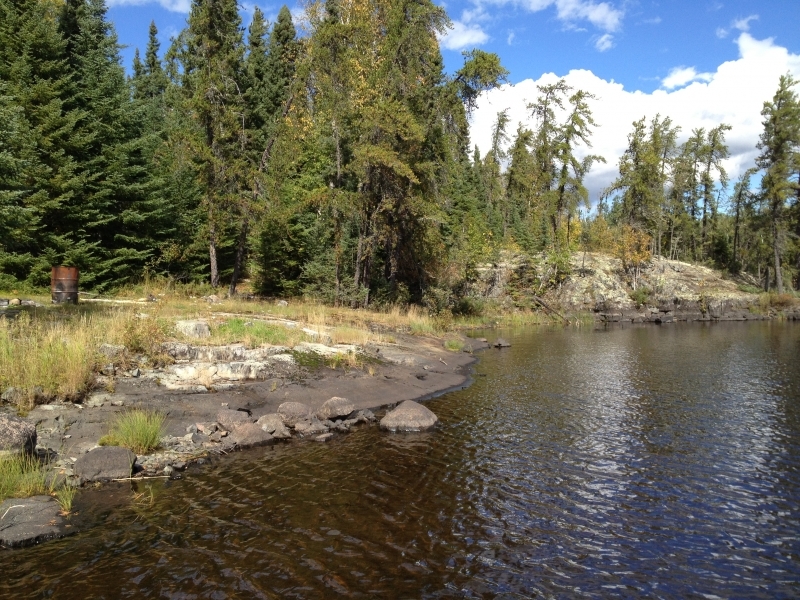 The lake stretches 10 miles through the Canadian wilderness before emptying into the Root River system. The water is dark, deep and spawns outstanding catches of Walleye and Northern from early spring to almost late fall. Otatakan Lake has been referred to as a Walleye factory as every reef and bay holds so many fish. The sheer numbers will keep novice or pro happy with its steady action. A perfect lake to take the family. Another only outpost on the lake, the Wright is the perfect destination for your family fishing vacation! Wright Lake is located 110 from the Clark’s Resort’s air base in Ear Falls. This stained water lake is truly an angler’s paradise with 5 interconnecting lakes to fish and explore. The Walleye fishing is superb and as for Northern fishing, it doesn’t get any better than this. -- The Frosts from the Midwest (visiting since the early 70's)"